Is there anything Josh Donaldson can’t do? It hasn’t even been half of a season in a Toronto Blue Jays uniform, and yet Josh Donaldson continues to amaze people on a weekly basis. The latest of which will likely have everyone buzzing for a very, very long time. The catch made earlier today by Josh Donaldson has already been dubbed as the “play of the year” and in my mind, it definitely deserves that grandiose title. 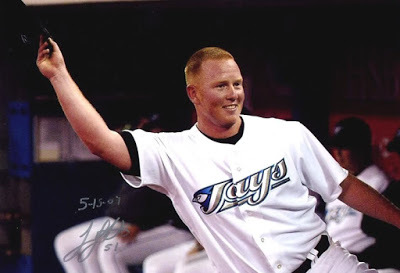 But considering the severity of the situation and the degree of difficulty, it might actually be one of the best plays ever by a Blue Jays player. The degree of difficulty on this catch cannot be understated. Josh Donaldson dove into the third row of the seats and managed to miraculously come up with the ball. 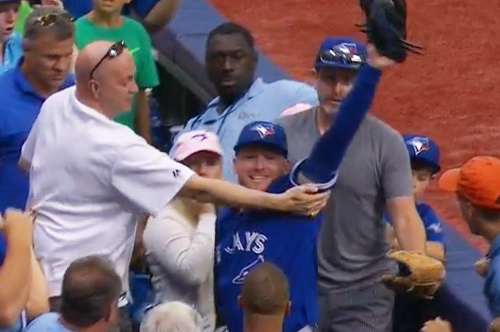 He tracked the ball to a place where most fans themselves can’t even make the catch, and Donaldson hurled over a barrier and two rows of seats to make the catch. Luckily, he had some help from the surrounding fans to make sure he didn’t come barreling down on the seats. Given the history of the Blue Jays former oft-injured third baseman, the fact that Josh Donaldson didn’t break any ribs, suffer a leg contusion or strain an oblique on that catch is astounding. The funny thing is, Josh Donaldson almost plays the game with nearly the same reckless abandonment as Brett Lawrie does. But for whatever reason, Donaldson’s baseball acumen allows him to make these plays relatively unscathed. And it wasn’t just the catch itself, it was the gravity of the situation. That play helped preserve what was at the time, a perfect game by Marco Estrada. Had Donaldson not made the play, it would’ve gone as a foul ball and the count would still be 3-2. However, that play by Donaldson alone got Estrada one out closer to that elusive perfect game. And had the perfect game or no-hitter stood up, that play by Josh Donaldson likely goes down as one of the best baseball plays in modern history. I feel bad for the young man who was unfortunately hit by Donaldson’s descending tree-trunk legs on the play. But we all know he’s going to school tomorrow to totally brag about it, right? I definitely would. One of the funnier parts about this play is the looks on Josh Donaldson’s face immediately following the catch. First, there’s the look of joy as he realizes he just helped preserved a perfect game. And then there’s the look of sheer horror shortly after when he realizes he may have injured a child in the process (he ended up being okay, as per Barry Davis). 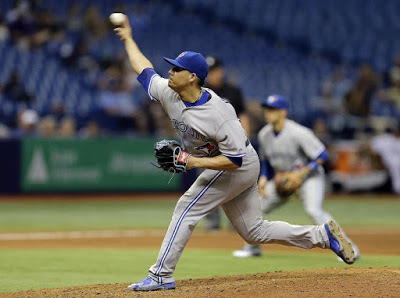 All in all, an extremely entertaining game … one which the Blue Jays thankfully won after an incredible pitching performance by Marco Estrada. 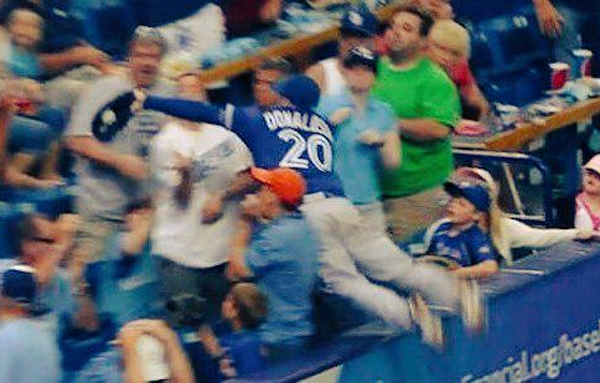 But Josh Donaldson’s catch is the one thing that will have people talking for a very long time.